Our latest project is learning a freestyle routine called “Bug’s Life”. Its a choreographed routine to music where a whole group of cute little dogs dance around in wings. So all that said the hard work starts with just wearing these wings. This is Sprocket. 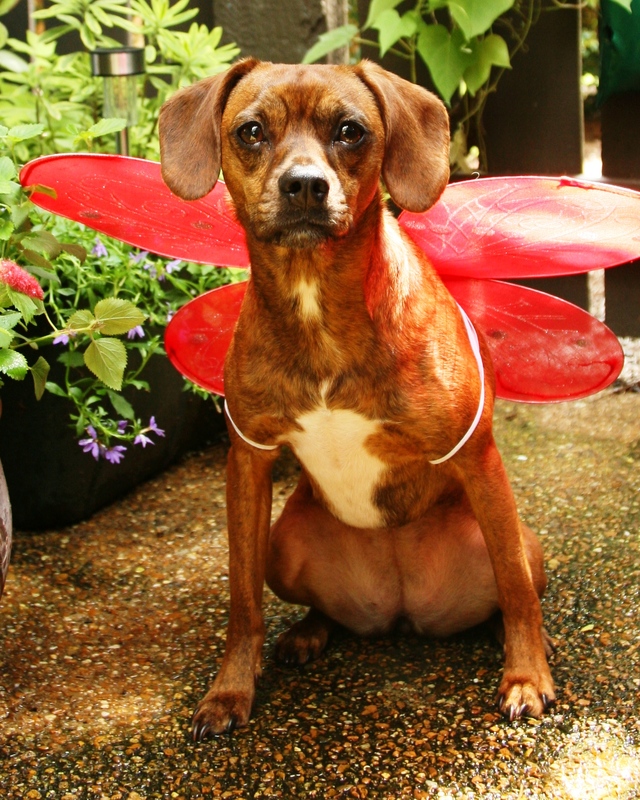 Today I’m teaching her to 1) wear her wings without eating them and 2) sit on the step stool while wearing the wings. As the music starts each dog will be on a step stool with the handler standing in front of them. I have already reinforced Sprocket for getting onto the stool, remaining on the stool, and sitting on the stool. She will offer this behavior as soon as she sees the stool. So now she is ready to add the wings! 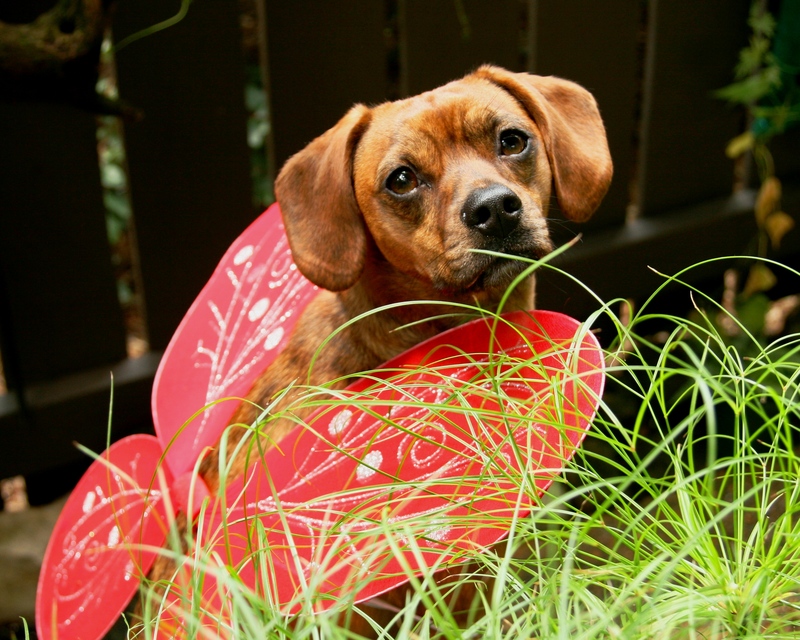 I put the wings on Sprocket then mark correct behaviors frequently. I mark (click) any time she focuses on me and anytime she is still. If both happen then that’s even better. She learns quickly and understands the click means she is correct so this doesn’t take long. Being still is the most difficult thing for her to do so I keep the training session short. First she is rewarded for being still and focusing on me while she is on the ground. Once she has that then I add the stool. 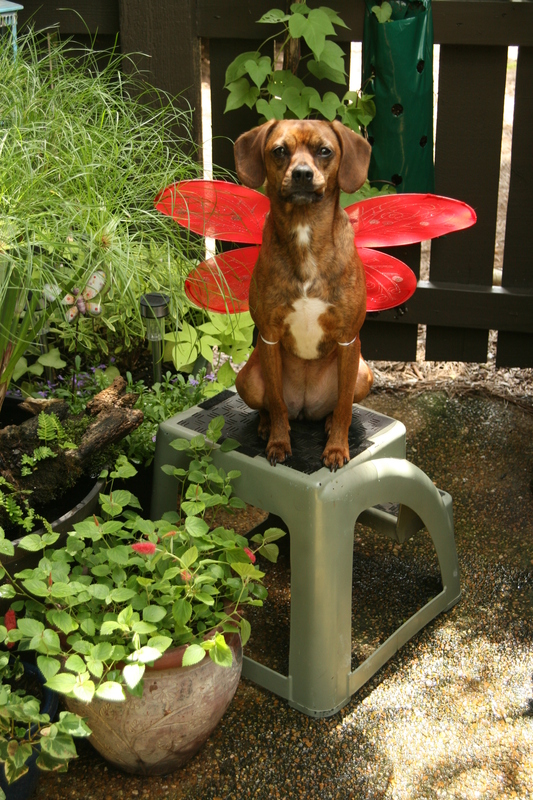 So the final product is my busy, busy puppy sitting still on the stool while wearing wings. Success! The next step will be to add duration and change up our location. The presentation of the whole routine will be done outside in a park with a crowd of people and dogs around so there is quite a bit of training left to be done.